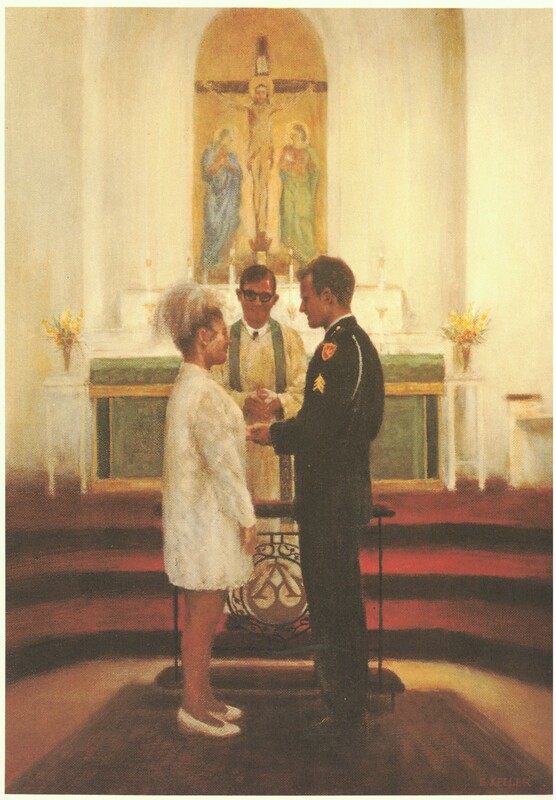 Many years ago (during the war in Vietnam) the U.S. Army Chaplain Board produced a series of prints called “History of the Chaplaincy.” A few years later, a second set was produced called, “Chaplain Activities.” “Both these sets were prepared for the purpose of supplying … display materials on the Army Chaplaincy.” Another individual print was released in 1973 titled “The Airborne Chaplain.” Occasionally, you can still find them hanging on the walls of chapels on Army posts, often faded from years in the Sun. 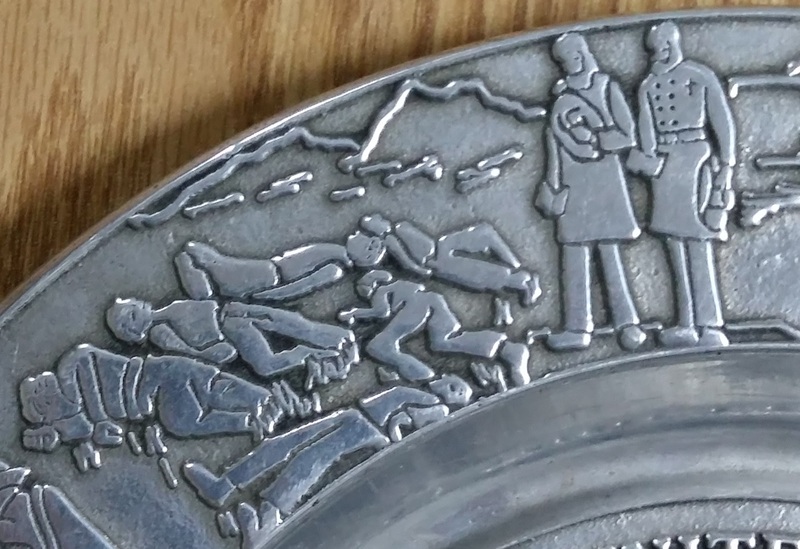 If you’re fortunate enough to find sets of them still tucked away in their envelopes, you get a beautiful set of un-faded prints which pictorially show the history and activity of Army Chaplains. 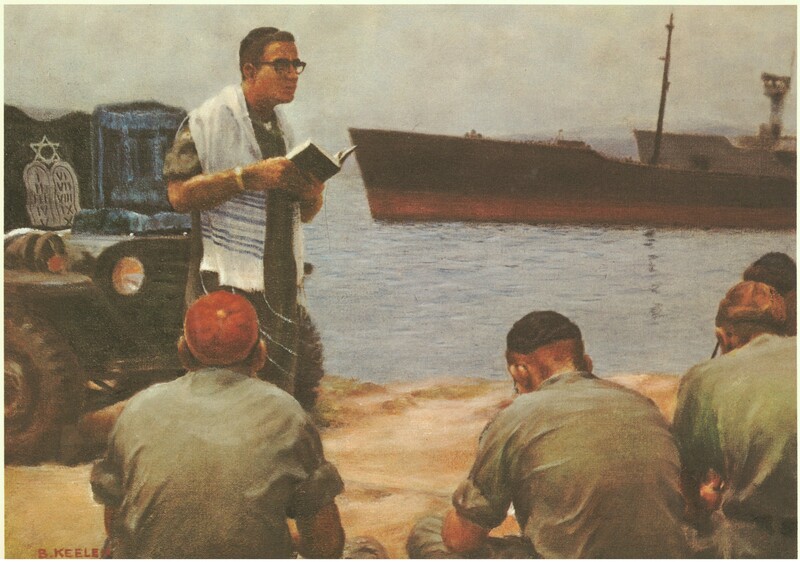 “The Symbolic Chaplain (artist: Stanley Melzoff). War is dreadful, desolating business. It can brutalize a nation, blight its moral and spiritual perception. But it is difficult to see how that can ever happen to America as long as our troops go to battle accompanied by these ‘Soldiers of God’ who bear no arms, whose purpose is not death, but a deeper, more meaningful life for all mankind. 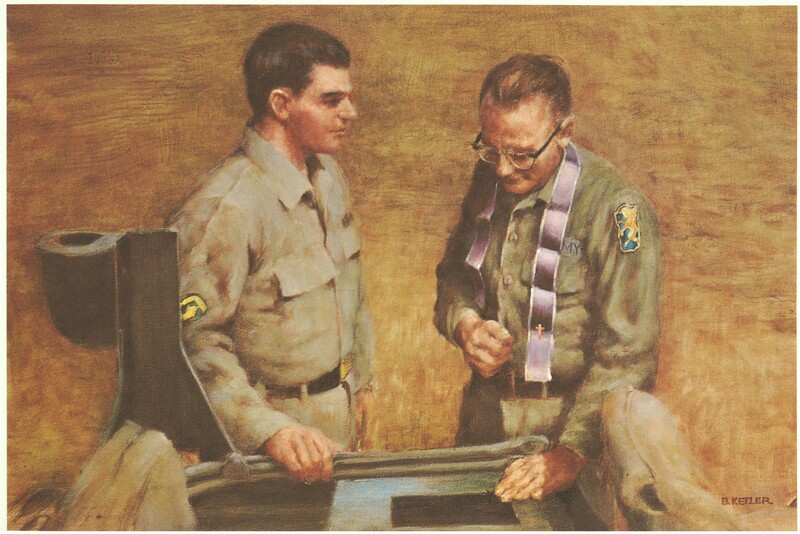 United States Army Chaplains affirm the values they preach by serving with courage and valor under all circumstances and in the faith of those noble words of the 23d Psalm: ‘The Lord is my Shepherd; I shall not want . . . . he leadeth me in the paths of righteousness for his name’s sake. Yea, though I walk through the valley of the shadow of death, I will fear no evil: for thou art with me; thy rod and they staff they comfort me . . . . Surely goodness and mercy shall follow me all the days of my life: and I will dwell in the house of the Lord forever.’ It is clear that they lead their men beyond patriotism to dimensions of the spirit” (author’s collection). “The Chaplain of 1745 (artist: Stanley Meltzoff). 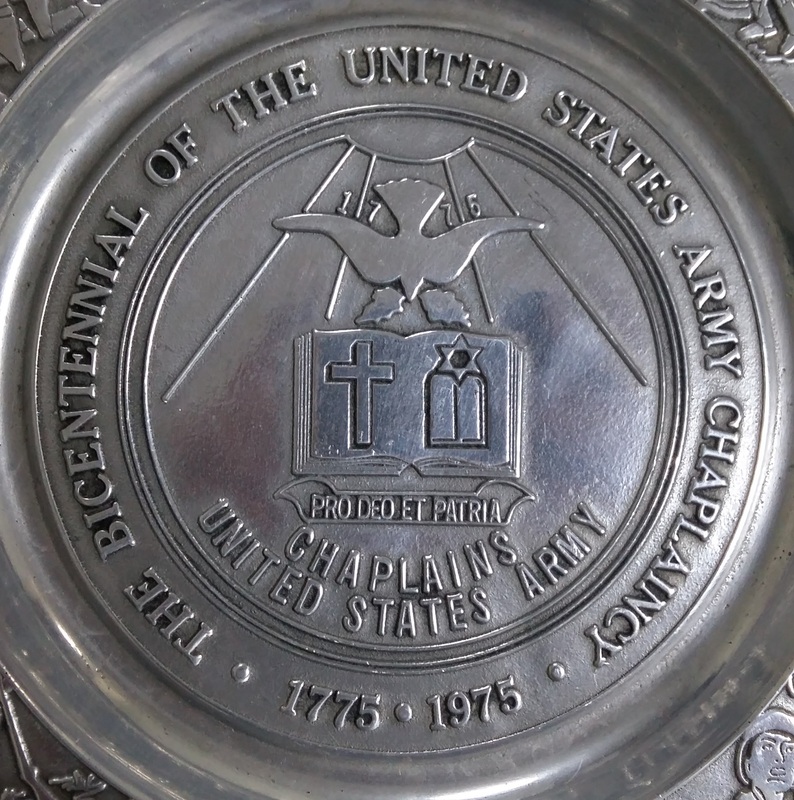 The history of the Army Chaplaincy reaches back to the labored beginnings of the Nation. During the early struggle, often called King George’s War, a group of ten clergymen (one with the unusual name of Moses Coffin who was also a drummer) served as chaplains. 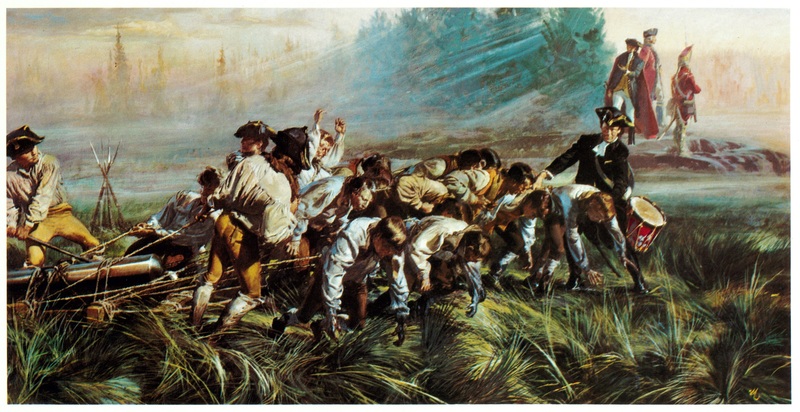 Nine of them ministered to the troops during the daring and decisive enterprise, the ‘Louisburg Campaign.’ They were described as a ‘goodly company of preachers’ ” (author’s collection). 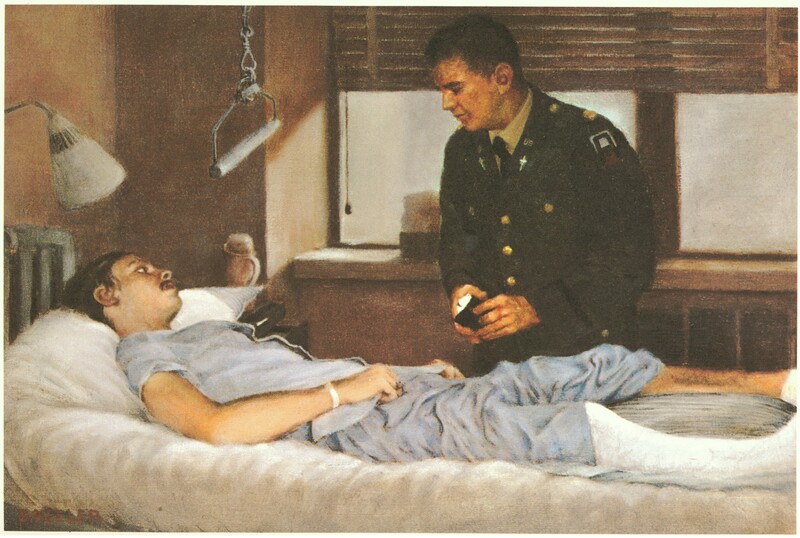 “The Chaplain at Breed’s Hill (artist: Ken Riley). The United States Army Chaplaincy was officially created by an act of the Continental Congress in 1775 upon the urgent request of General George Washington. The name of the first chaplain appointed under this authority is unknown; several were with the Army at that time. 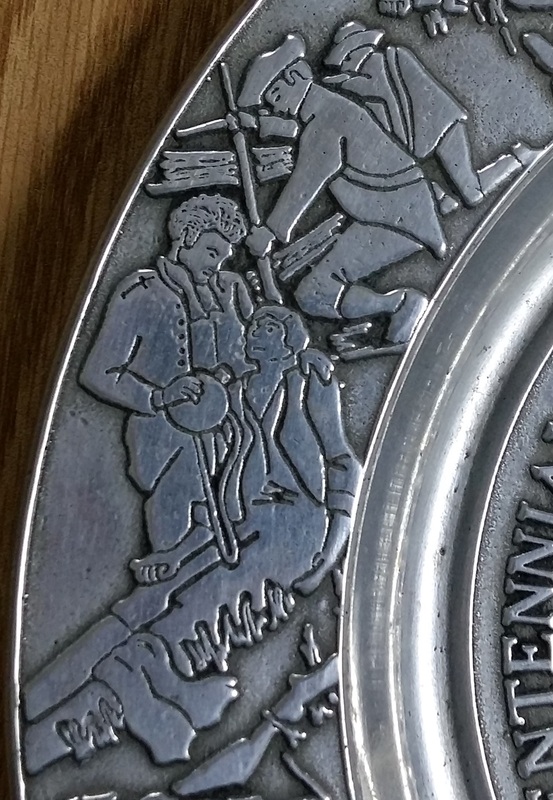 David Avery, who was with the troops at Breed’s Hill, may stand as typical of the group” (author’s collection). 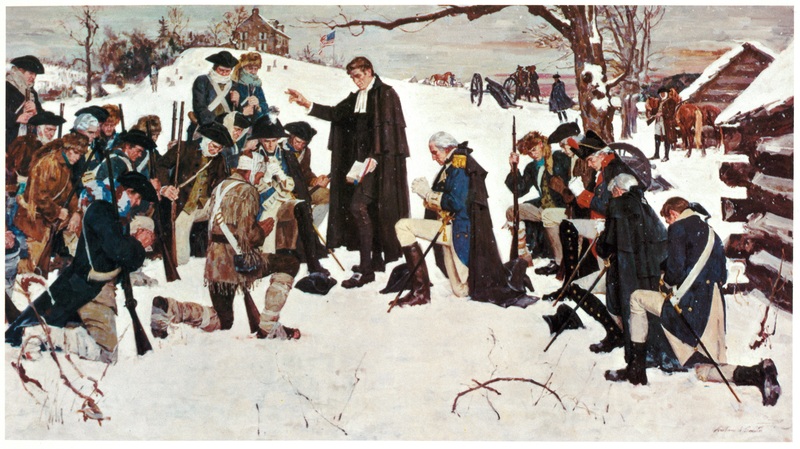 “The Chaplain at Valley Forge (artist: William A. Smith). History records that our first commander-in-chief was a man of sincere religious faith. He depended heavily upon the chaplains of the Continental Army for their spiritual and moral leadership. Israel Evans was sometimes referred to as ‘General George Washington’s Chaplain.’ He led the Army in prayers at Valley Forge. Before a battle, he usually prayed that the Lord of Hosts would lead the Army to victory, if that be according to Divine Will; if not, he begged God to stand neutral and let ‘flesh and blood’ decide the issue” (authors collection). 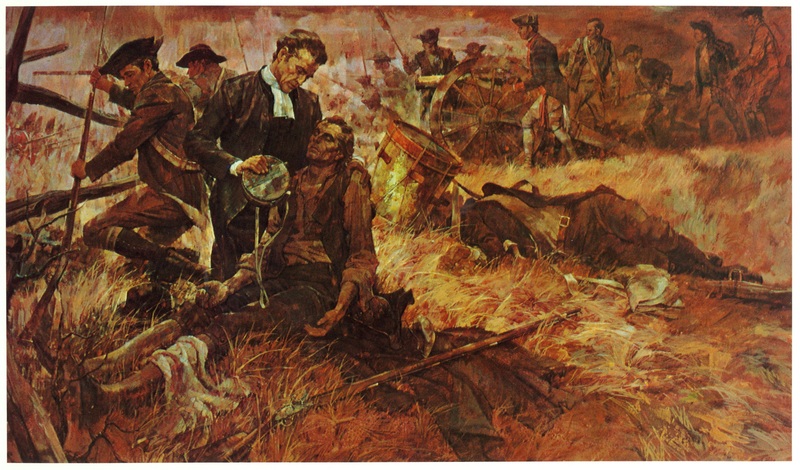 “The Chaplain at Gettysburg (artist: William A. Smith). 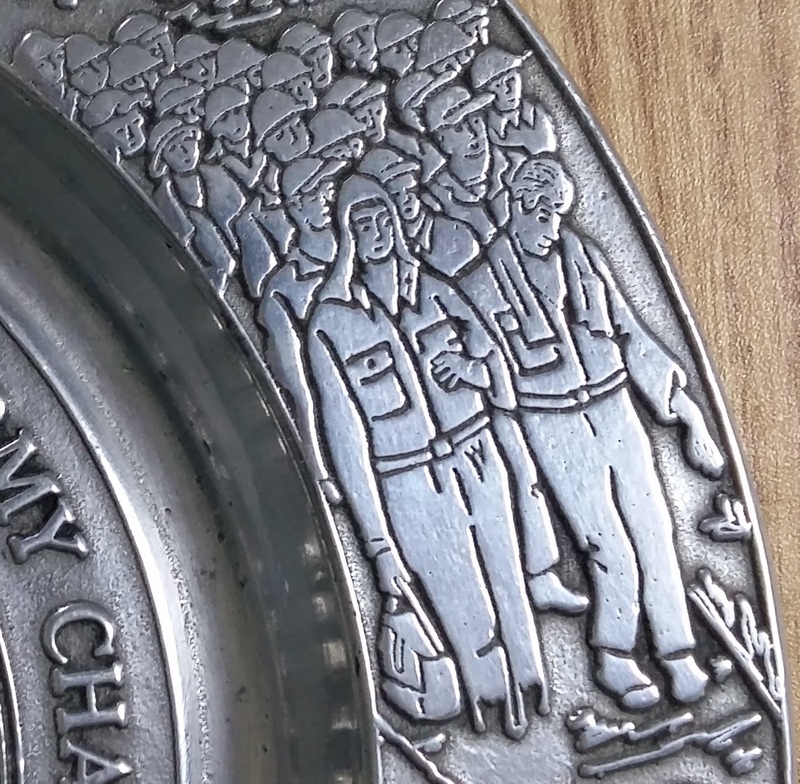 During the tragic years of the War Between the States, when bitterness and invective flowed from both sides, chaplains representing the ‘Blue’ and the ‘Grey’ numbered over 3,300, and their common mission gave a new sense of brotherhood among them. Their ministry did much to keep hope alive, and later, to heal the wounds of war. 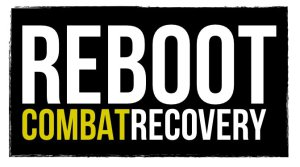 One summed up his mission thus: ‘I want this regiment, bold and daring as it is in the country’s cause, to be eminent for moral and religious influences–and to be welcomed at home as good citizens made wiser and better by the discipline of Army life” (author’s collection). 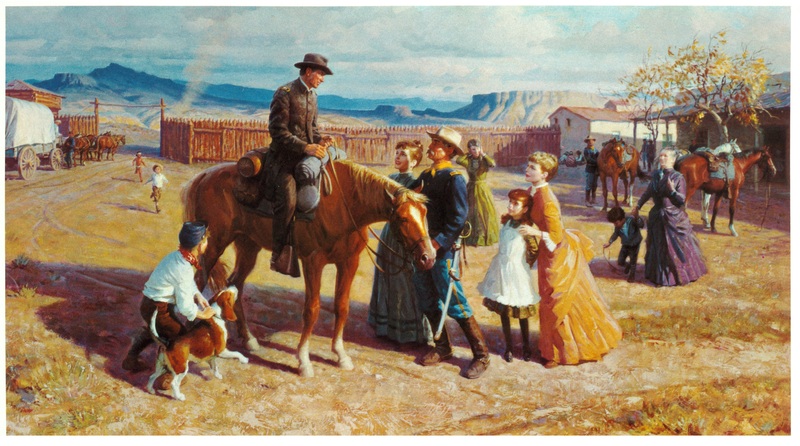 “The Chaplain on the Western Frontier (artist: Tom Lovell). The chaplain goes where the Army goes. 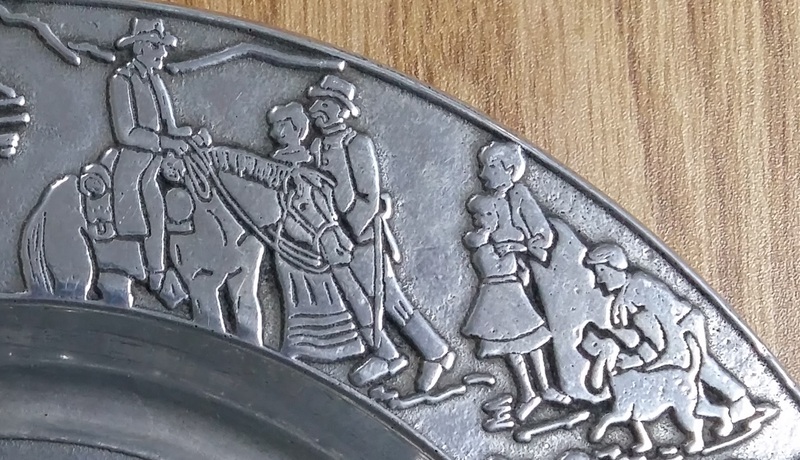 Through the decades of warfare with the Indians and the opening of the western frontier, these soldiers of God were literally ‘Circuit Riders,’ ministering to the troops and their families in primitive outposts along the perimeters of American civilization. It is recorded that they also took advantage of opportunities to ‘bring the light of truth and faith’ to the Indians and their children” (author’s collection). 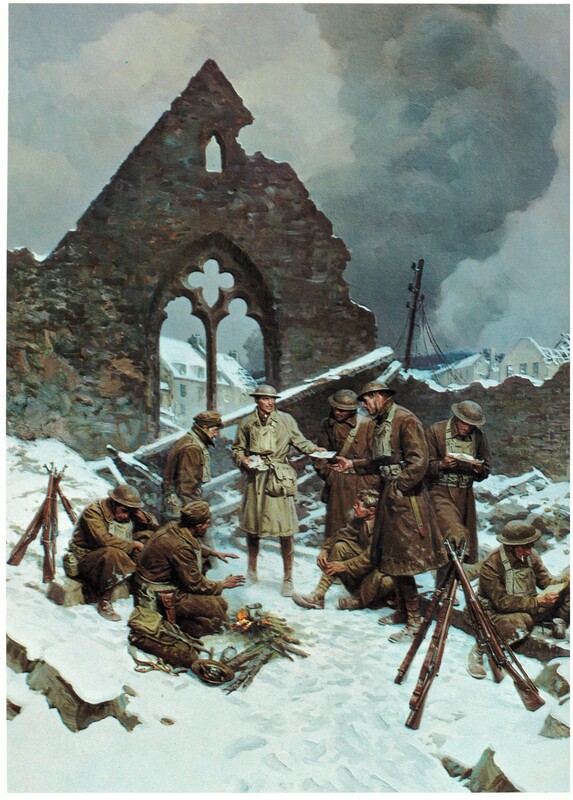 “The Chaplain in World War I (artist: Tom Lovell). During the ‘Great War,’ 2,400 chaplains, representing Protestant, Catholic, and Jewish faiths served with the American Expeditionary Forces. Twenty-three died in the service of God and Country; 27 were wounded in action, and 59 were decorated for acts of bravery above and beyond the call of duty. During this difficult period, a high sense of fraternity and cooperation developed among the chaplains of different faiths. They earned the lasting affection and admiration of the officers and men as they moved about through the trenches providing a spiritual ministry to all, without regard for their particular faith” (author’s collection). 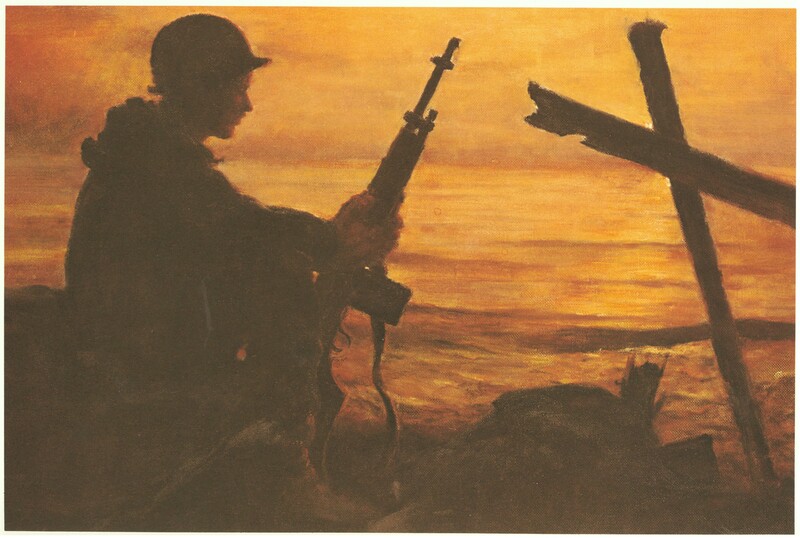 “The Chaplain in World War II (artist: Ken Riley). More than 8,000,000 Americans served in the U.S. Army in World War II. About 9,000 chaplains representing 31 denominations offered them the comfort and strength of religious faith in every quarter of the globe. They accompanied the troops on the infamous ‘Bataan Death March’ and eighteen died of starvation and maltreatment in the prison camp at Catabanatuan in the Philippines. 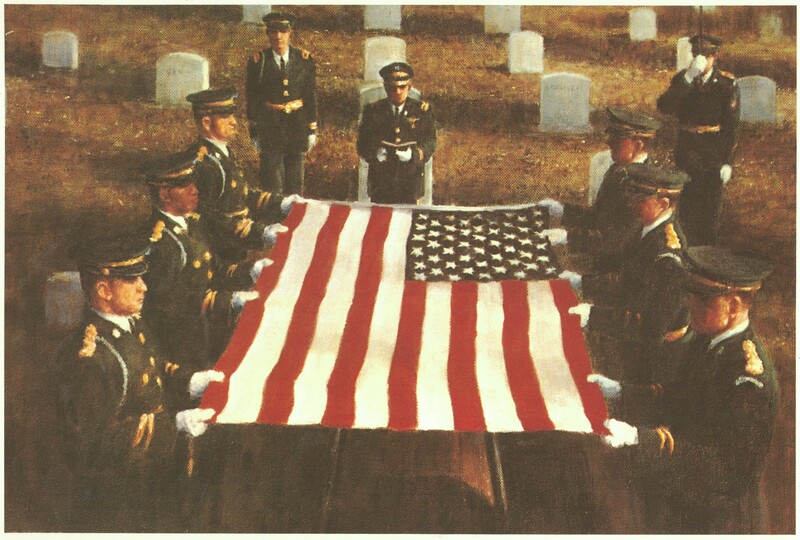 They shared with our fighting forces the hardships and anguish of combat, and the responsibilities imposed by victory. 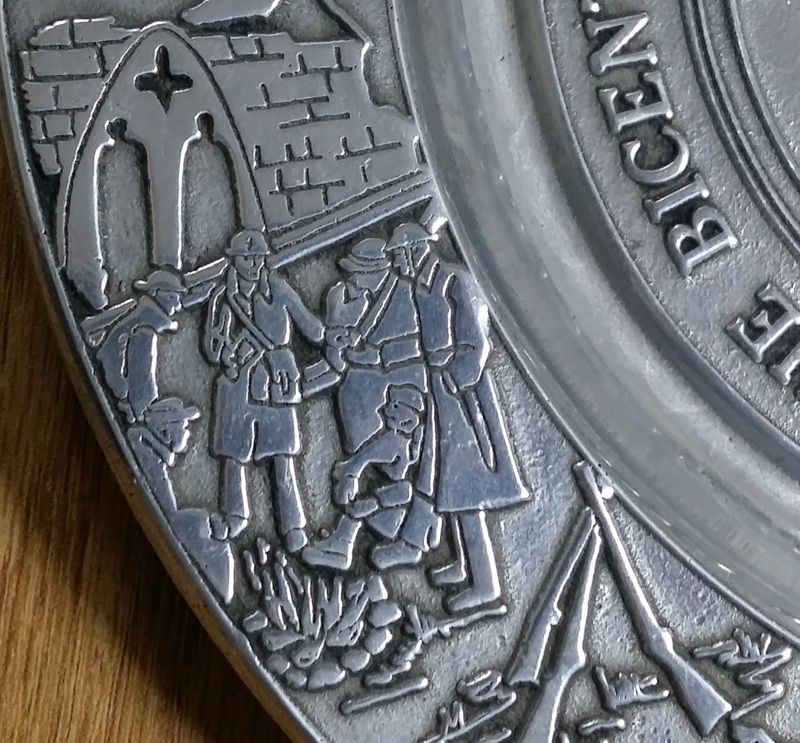 Their record contains uncounted deeds of devotion and gallantry, and 2,395 were decorated by a grateful Nation for heroic actions” (author’s collection). 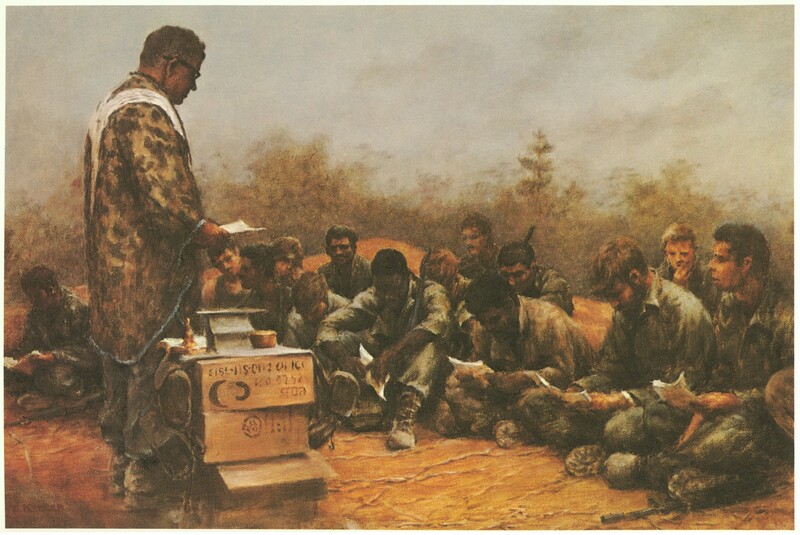 “The Chaplain in the Korean Conflict (artist: William A. Smith). 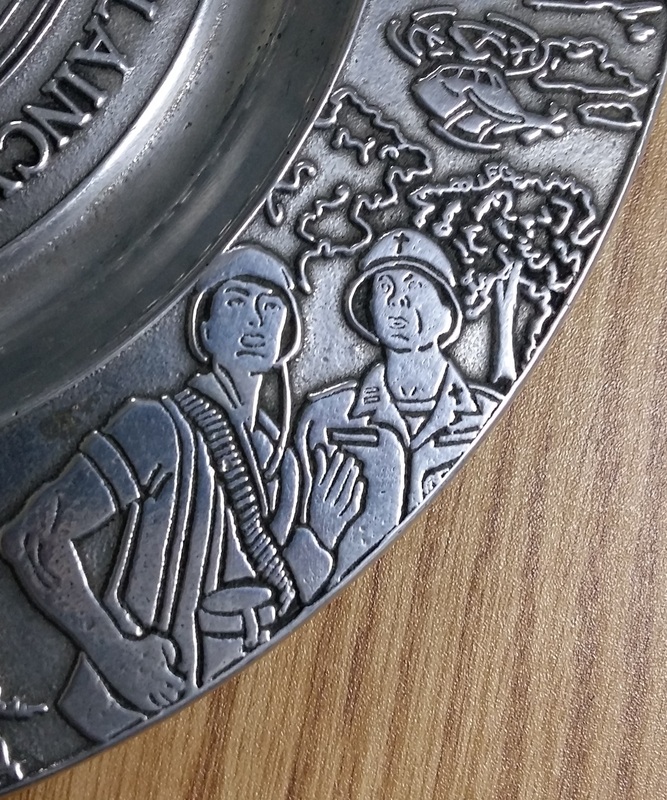 In the Korean Conflict, Americans found themselves fighting against a new kind of enemy–a foe who sought not only to capture territory, but to enslave men’s minds and souls. 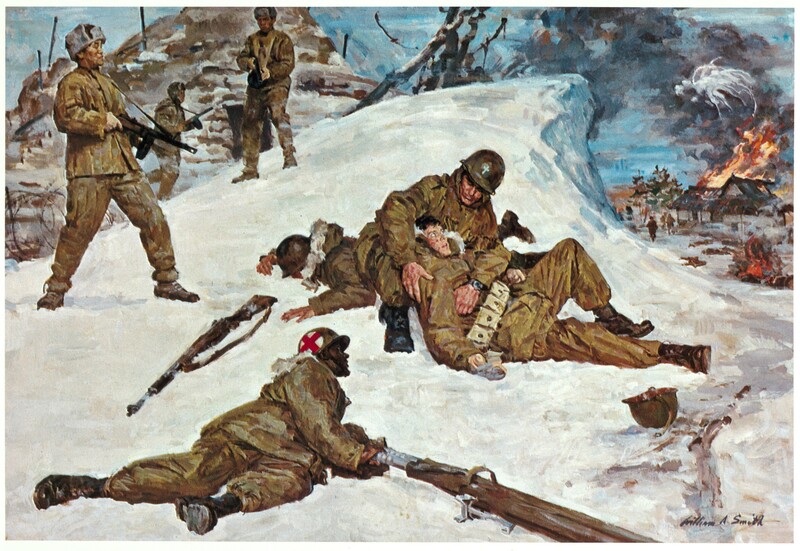 Once more, chaplains shared frontline dangers and and sometimes paid for it with their lives. They found themselves called upon to work in an army composed of fifteen nations, and this challenge extended the already broad dimensions of their sense of brotherhood. 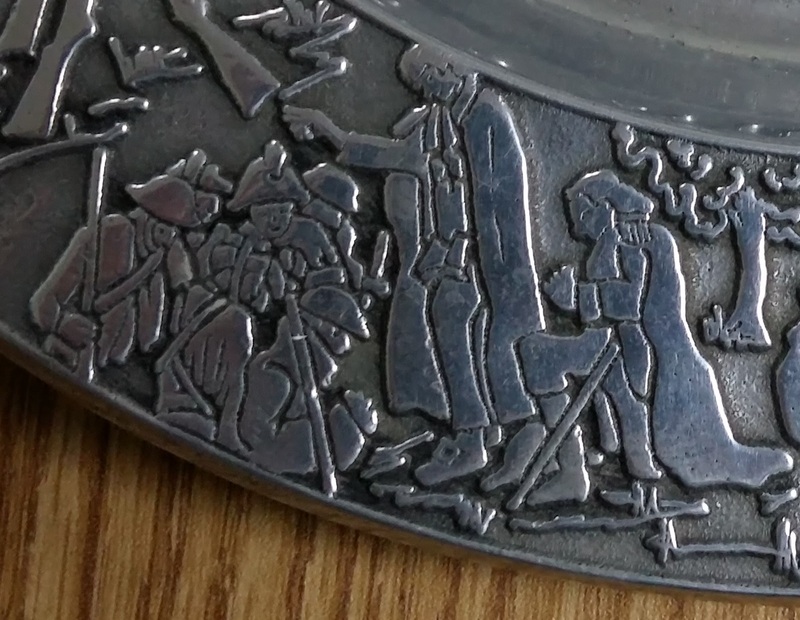 It was in the prisoner-of-war camps where the enemy sought to erode the morale of the Americans. In these bleak and depressing compounds, with men at the very edge of endurance, it was the exemplary spirit of people like Emil J. Kapaun, that engendered not only the will to survive but also to resist. Later, he was to die in an enemy prison. It was said of him by one who knew him in prison, ‘He was the symbol of something the enemy knew he could not kill–the unconquerable spirit of a free man, owing final allegiance only to God” (author’s collection). 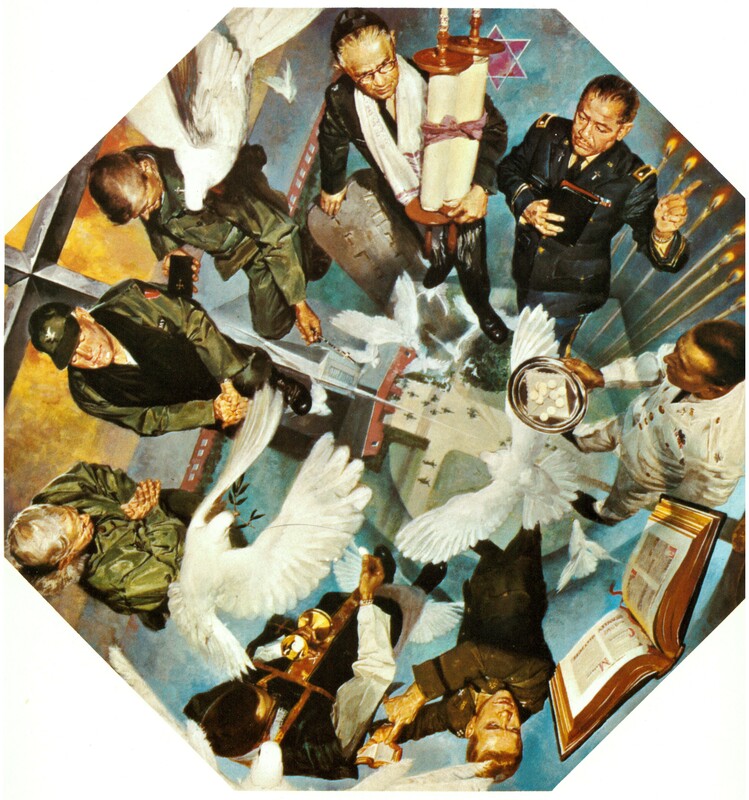 “The Chaplain in Southeast Asia (artist: Tom Lovell). 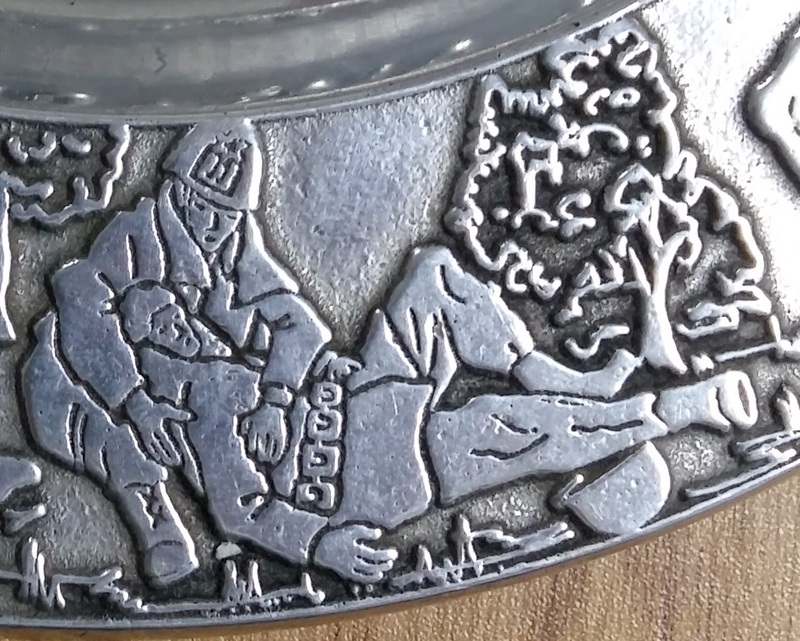 Breed’s Hill, Valley Forge, Gettysburg–the Indian Wars, France, Bataan, Korea. In all these places, the American soldier–and the Army Chaplain–have served with distinction. Today, in Southeast Asia, they are repeating their record of heroism. From the beginning of our national history, Chaplains, as soldiers of God, have helped to shape the heritage of America. Through patriotism and courage, they are today bringing religion and moral strength to soldiers of our country as they protect the ramparts of our national security” (author’s collection). Chaplain Activities: The Soldier-Focus of the Chaplain’s Ministry (author’s collection). Chaplain Activities: Counseling (author’s collection). Chaplain Activities: Marriage (author’s collection). Chaplain Activities: Hospital Visitation (author’s collection). 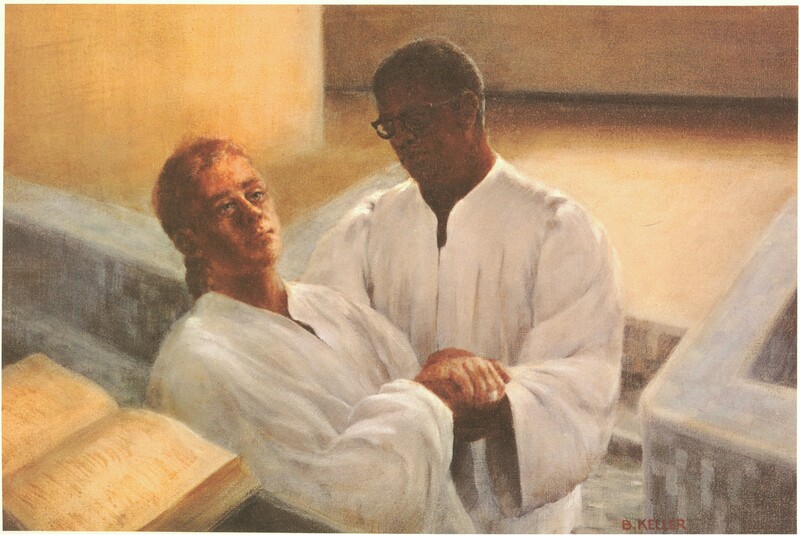 Chaplain Activities: Baptism by Immersion (author’s collection). Chaplain Activities: Jewish Services in the Field (author’s collection). Chaplain Activities: Mass in the Field (author’s collection). 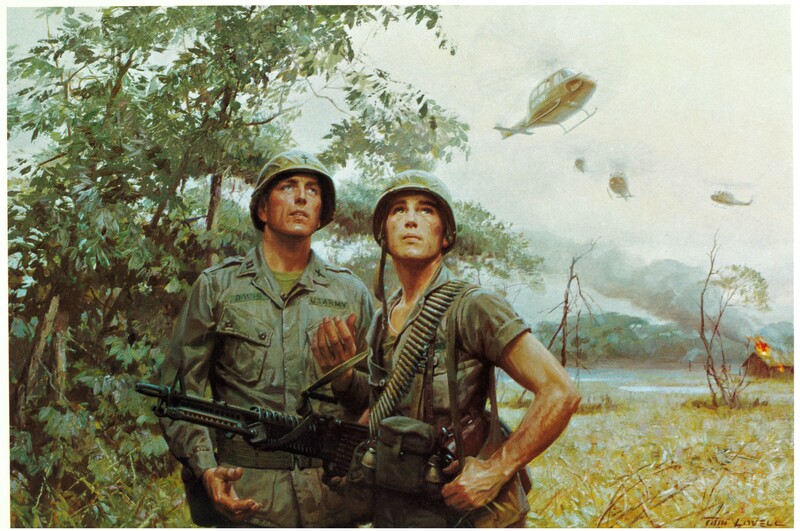 “The Airborne Chaplain” (Artist: John Norris). Chaplain Theodore R. Owens, World War II veteran and the first Black chaplain to earn the coveted paratrooper’s badge, typifies the dedicated contribution of the great variety of ethnic and racial groups represented throughout the history of the chaplaincy” (photo courtesy of Chaplain Bob Nay). 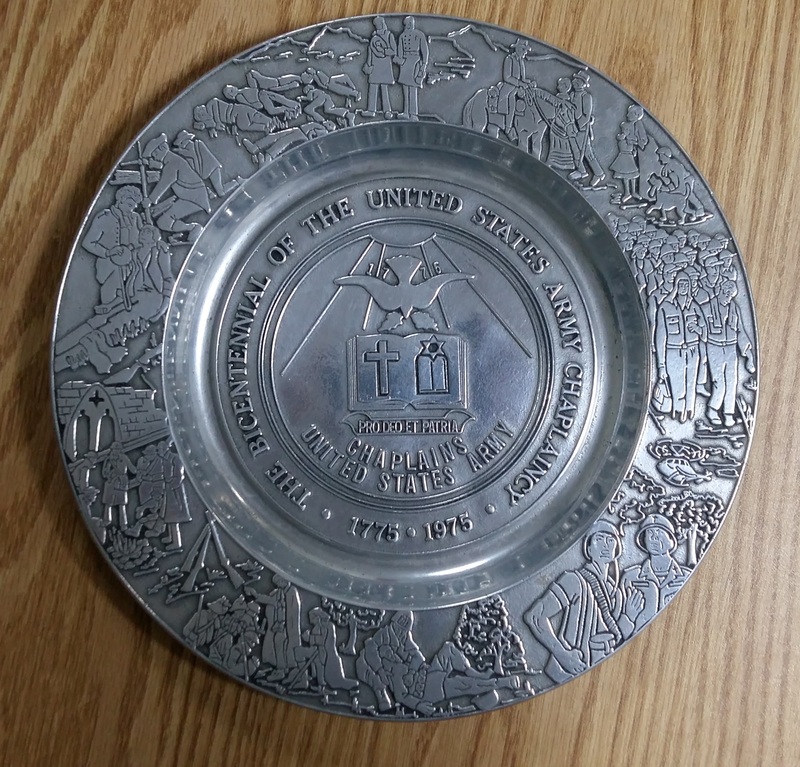 The Chaplain Corps also produced a pewter plate in 1975 for the bicentennial of the Chaplain Corps which used the same artwork in the first set of prints on the History of the Chaplaincy.